Iren and Giulio Barbieri S.r.l. are cycling into the future, thanks to the electric bike-sharing “EVO-BIKE” stations that will be installed at the IREN offices in Genoa and Parma, and made accessible to all employees. Ferrara, 12th June: On Friday 1st June, Giulio Barbieri S.r.l. took part in the press conference to introduce the new project by Iren dedicated to e-mobility. The multi-utility company haslaunched the IrenGo project in several Italian municipalities and, starting with the mobility of employees in the cities involved, it intends to improve the environmental habits of citizens. Giulio Barbieri S.r.l., a Ferrara-based company specialising in the creation of solutions for e-mobility and for the outdoors, will take part in the project in the municipalities of Genoa and Parma thanks to one of its leading products in the field of green solutions: the EVO-BIKE rental and charging station. 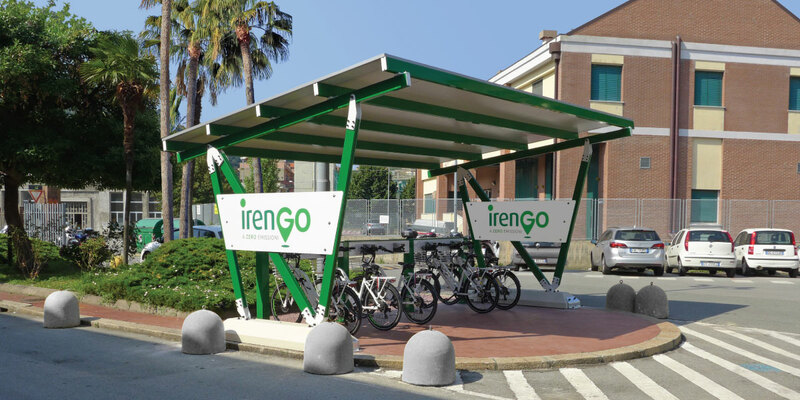 Specifically, as regards the IREN headquarters in Genoa, the company will be responsible for the construction of a rental station consisting of 6 electric bikes with pedal assistance and a self-supporting carport for the protection of the bikes; the same quantity of bikes will go to the headquarters in Parma. Additionally, in a few weeks' time, inside the Palazzo Ducale in Genoa, a small temporary charging station will be set up for 4 bikes at a time, in order to promote sustainable mobility for citizens and tourists too, by preparing special itineraries to make the city known from a new perspective. "We are proud to take part in an initiative of this kind,” said Giulio Barbieri, the president of the homonymous company, “we are living in a period of historical importance, in which it is crucial to make ethical choices in order to protect the land and the environment, to allow our children and future generations to enjoy a clean world, and the IrenGo project is an excellent opportunity to take an active stand and to opt for low-impact energies".